Geophysics professor Magali Billen (UC Davis) has received a Research Award from the Humboldt Foundation, and will arrive at LMU in September to collaborate with Professor Heiner Igel at the Department of Earth and Environmental Sciences. 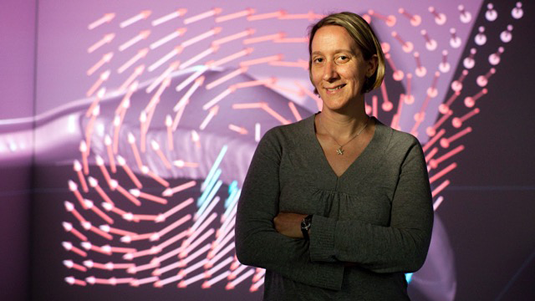 Magali Billen is a geophysicist whose research focuses on geodynamics and tectonophysics. She studies the physical processes that underlie the motions and deformation of the Earth’s tectonic plates. Specifically, she uses three-dimensional numerical simulations to elucidate the forces that contribute to the sinking of tectonic plates into the underlying mantle at so-called subduction zones. The term ‘subduction zone’ refers to a region in which the edge of one tectonic plate dips below another at a so-called convergent plate boundary. Billen is particularly interested in the relationships between the behavior of the plates and the deformation properties of their constituent rocks, and in how these interactions are reflected in the overall motions of the plates. During her stay at LMU, Billen plans to analyze the impact of specific characteristics of deformed rocks on the flow of the underlying mantle around the edge of the subducting plate. Magali Billen studied Geophysics at the California Institute of Technology in Pasadena (USA), earning her PhD there in 2001. Following stints at Leeds University (UK) and the Woods Hole Oceanographic Institution (USA), in 2002 she took up a post at the University of California in Davis where she was named Professor of Geophysics in 2013.